On Sunday, March 17 at 7:00 p.m. Counterpath hosted the Denver launch of the new edition of the groundbreaking Norton Anthology of Postmodern American Poetry. With readings by Julie Carr, Graham Foust, Noah Eli Gordon, Bin Ramke, Eleni Sikelianos, Anne Waldman, and introductions by Paul Hoover (editor of the anthology). Please see below for videos of the event. This new edition revisits postmodernism as a twenty-first-century movement. 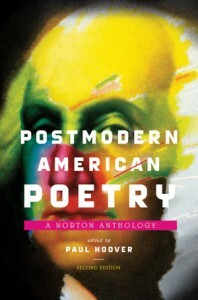 Postmodern American Poetry: A Norton Anthology galvanized attention on its publication in 1994, making “the avant-garde accessible” (Chicago Tribune) and filling “an enormous gap in the publication annals of contemporary poetry” (Marjorie Perloff). Now, two decades later, Paul Hoover returns to suggest what postmodernism means in the twenty-first century. This revised and expanded edition features 114 poets, 557 poems, and 15 poetics essays, addressing important recent movements such as Newlipo, conceptual poetry, and Flarf. Bringing together foundational postmodern poets like Charles Olson, Denise Levertov, and Allen Ginsberg with new voices like Christian Bok, Kenneth Goldsmith, and Katie Dengentesh, this edition of Postmodern American Poetry is the essential collection for a new generation of readers. Graham Foust is the author of several collections of poetry, including A Mouth in California (Flood Editions, 2009) and To Anacreon in Heaven and Other Poems (forthcoming from Flood Editions, April 2013). He teaches at the University of Denver. Julie Carr is the author of four books of poetry, Mead: An Epithalamion, Equivocal, 100 Notes on Violence, (winner of the Sawtooth Poetry Prize, 2009), and Sarah-Of Fragments and Lines (a National Poetry Series winner for 2010). Her study of Victorian poetry and poetics is forthcoming from Dalkey Archive. In addition to teaching creative writing, she teaches courses on British and American poetry from the Victorian period to the present. Carr is also the co-publisher, with Tim Roberts, of Counterpath Press. Bin Ramke edits the Denver Quarterly and teaches literature and creative writing in the English Department. During his childhood in the south he intended to become a mathematician, and then a sculptor, but ended up at LSU a literature major instead. Later he received a Ph.D. from Ohio University then taught in Georgia prior to arriving at the University of Denver. He sometimes teaches part of the year at the School of the Art Institute of Chicago. His first book won the Yale Younger Poets Award, and he has since published eight other books of poems, most recently Tendril (Omnidawn, 2007). Ramke was awarded the Phipps Chair, and is an Evans Professor. Anne Waldman, recently deemed a “counter-cultural giant” by Publisher’s Weekly, is a poet, performer, professor, editor, and cultural activist. She is the author of more than 40 books and has concentrated on the long poem as a cultural intervention with such projects as Marriage: A Sentence, Structure of The World Compared to a Bubble, Manatee/Humanity (all three books published by Penguin Poets) and the anti-war feminist epic The Iovis Trilogy: Colors in the Mechanism of Concealment, recently published by Coffee House Press in 2011. Q and A with Paul Hoover. Paul Hoover’s most recent publications are Sonnet 56 (Les Figues Press, 2009); Beyond the Court Gate: Selected Poems of Nguyen Trai (Counterpath Press, 2010), edited and translated with Nguyen Do; and Selected Poems of Friedrich Ho?lderlin (Omnidawn Publishing, 2008), winner of the PEN-USA Translation Award, edited and translated with Maxine Chernoff.